Having entered the Lehi Swimming Pool, either through payment of daily admission, season or monthly pass, part of a rental, or any other means, each person or person(s) agrees to comply with the facility rules as outlined on the facility signs. Failure to do so can result in expulsion from the facility either temporarily or in extreme cases permanently. In either case, there will be no refunds. 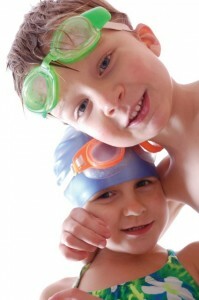 Children under 8 must be supervised in the water by an adult 18 years or older. Children 5 and under must be accompanied in the water by an adult 18 years or older at all times. Any person suspected of being under the influence of alcohol or drugs will be prohibited from entering the facility. NO SMOKING anywhere within the facility. No glass containers, food, or gum are allowed on the pool deck. Non-swimmers are not allowed in the diving pool. Only approved bathing suits. No cutoffs or Levis. Aquatic diapers and plastic pants are required for children 3yrs and under and anyone that does not have control of their bowels. No person with an open sore or infection is allowed in the pool. Only approved floatation devices are life jackets! Only approved play-balls and toys.